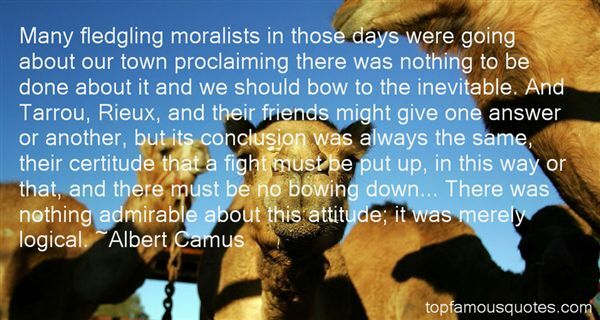 Reading and share top 9 famous quotes and sayings about Bowing Down by famous authors and people. 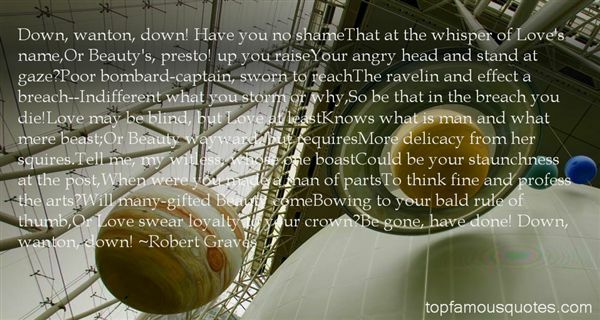 Browse top 9 famous quotes and sayings about Bowing Down by most favorite authors. 1. "Many fledgling moralists in those days were going about our town proclaiming there was nothing to be done about it and we should bow to the inevitable. And Tarrou, Rieux, and their friends might give one answer or another, but its conclusion was always the same, their certitude that a fight must be put up, in this way or that, and there must be no bowing down... There was nothing admirable about this attitude; it was merely logical." 2. "You gotta promise to never leave me. I-I… you just gotta. "Her response is, "You have to promise to try to love me back. What you're doing to me…that's not how you treat a person you love, Twitch. "I've loved you since you were six.Kissing her once more, I tell her without hesitation, "If you promise to never leave me, I will love you. And be good to you. I'll treat you like a queen. "My queen. I heard somewhere that a king only bowsdown to his queen. And I'm bowing down to Lexi. My chest aches. I don't know if I like this love thing." 3. "Kissing her once more, I tell her without hesitation, "if you promise to never leave me, I will love you. And be good to you. I'll treat you like a queen." My queen. I heard somewhere that a king only bows down to his queen. And I'm bowing down to Lexi." 4. 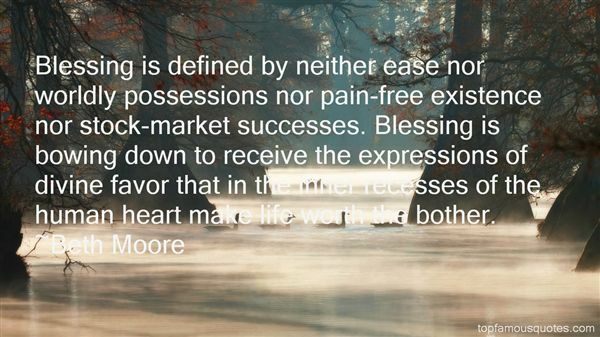 "Blessing is defined by neither ease nor worldly possessions nor pain-free existence nor stock-market successes. Blessing is bowing down to receive the expressions of divine favor that in the inner recesses of the human heart make life worth the bother." 5. "All money is imaginary," answered the Calcatrix simply. "Money is magic everyone agrees to pretend is not magic. Observe! You treat it like magic, wield it like magic, fear it like magic! Why should a body with more small circles of copper or silver or gold than anyone else have an easy life full of treats every day and sleeping in and other people bowing down? The little circles can't get up and fight a battle or make a supper so splendid you get full just by looking at it or build a house of a thousand gables. They can do those things because everyone agrees to give them power. If everyone agreed to stop giving power to pretty metals and started giving it to thumbnails or mushroom caps or roof shingles or first kisses or tears or hours or puffin feathers, those little circles would just lay there tarnishing in the rain and not making anyone bow their noses down to the ground or stick them up in the air." 6. "The music, the prayers, the bowing and rising, the incense--all of it was breaking down my defenses. That's what good liturgy does. It breaks your heart open and turns you toward God." 7. "Start with God - the first step in learning is bowing down to God; only fools thumb their noses at such wisdom and learning." 8. "Down, wanton, down! Have you no shameThat at the whisper of Love's name,Or Beauty's, presto! up you raiseYour angry head and stand at gaze?Poor bombard-captain, sworn to reachThe ravelin and effect a breach--Indifferent what you storm or why,So be that in the breach you die!Love may be blind, but Love at leastKnows what is man and what mere beast;Or Beauty wayward, but requiresMore delicacy from her squires.Tell me, my witless, whose one boastCould be your staunchness at the post,When were you made a man of partsTo think fine and profess the arts?Will many-gifted Beauty comeBowing to your bald rule of thumb,Or Love swear loyalty to your crown?Be gone, have done! Down, wanton, down!" 9. "Now as I climb this mountain, from the top of which I shall see Africa, my mind is printed with brown-paper parcels and your faces. I have been stained by you and corrupted. You smelt so unpleasant, too, lining up outside doors to buy tickets. All were dressed in indeterminate shades of grey and brown, never even a blue feather pinned to a hat. None had the courage to be one thing rather than another. What dissolution of the soul you demanded in order to get through one day, what lies, bowings, scrapings, fluency and servility! How you chained me to one spot, one hour, one chair, and sat yourselves down opposite! How you snatched from me the white spaces that lie between hour and hour and rolled them into dirty pellets and tossed them into the wastepaper basket with your greasy paws. Yet those were my life." Those who suffer great adversity and sorrow and go on to serve their fellowmen develop a great capacity to understand others. Like the prophets, they have acquired a higher understanding of the mind and will of Christ."